A weekly review of recently sold homes in Wallingford PA and current market statistics. There are 70 homes listed for sale in Wallingford PA and Nether Providence Township on April 23, 2019 with an average asking price of $453,826. Total existing-home sales – completed transactions for single-family homes, townhomes, condos, and co-ops – dropped 4.9% from February to a seasonally adjusted annual rate of 5.21 million in March. Sales are down 5.4% from a year ago, NAR’s data shows. There are 66 homes listed for sale in Wallingford PA and Nether Providence Township on April 16, 2019 with an average asking price of $454,224. Many homeowners may be one leaky or burst pipe away from a financial crisis. Nearly 20% of homeowners admit they have no money put aside for an emergency home repair, according to a survey of more than 1,400 homeowners by HomeServe USA. Yet more than half of the respondents say they’ve had a home repair emergency in the last 12 months. There are 63 homes listed for sale in Wallingford PA and Nether Providence Township on April 9, 2019 with an average asking price of $458,427. Homeowners are paying more for property taxes. Nationwide, the average property tax bill was $3,498 in 2018, up 3% compared to a year ago, ATTOM Data Solutions, a real estate data firm, reports in a new analysis. The effective tax rate was 1.16% in 2018 (which is the average annual property tax). New Jersey, Illinois, Texas, Vermont, and Connecticut had the highest effective tax rates in the country in 2018, the analysis showed. Property taxes rose faster than the national average in 58% of the markets tracked in the study. Of the 219 metro areas analyzed, 120 – or 55% – posted an increase in average property taxes above the national average of 3%. There are 68 homes listed for sale in Wallingford PA and Nether Providence Township on April 2, 2019 with an average asking price of $451,950. Median home prices in the first quarter of 2019 were not affordable to people making the average wage in 71% of U.S. counties, according to ATTOM Data Solutions’ Q1 2019 U.S. Home Affordability Report. Researchers calculated the amount of income needed to make a monthly house payment – including mortgage, property taxes, and insurance – on a median-priced home, assuming a 3% down payment. Overall, the average wage earner would need to spend 32.7% of their income to buy a median-priced home in the first quarter of 2019. The average earner would need to spend the highest share of their income to buy a median-priced home in King County (Brooklyn), N.Y. (115.9%); New York County (Manhattan), N.Y. (115%); Santa Cruz County, Calif. (114.1%); Marin County, Calif. (103.1%); and Maui County, Hawaii (100.7%). There are 61 homes listed for sale in Wallingford PA and Nether Providence Township on March 26, 2019 with an average asking price of $448,495. The Federal Housing Administration has announced tighter lending standards, which could put up to 50,000 mortgages in jeopardy annually. The FHA insures mortgages for first-time home buyers and often borrowers with low credit scores and high loan payments relative to their incomes. The clampdown is on lending rules that the FHA believes are allowing too many risky loans to be approved. The FHA says it will begin to flag more loans as “high risk.” Loans will go through a rigorous manual underwriting process, the agency says. The FHA claims it wants to ensure that it isn’t issuing loans to borrowers who can’t repay and better protect itself against an uptick in defaults that could ultimately deplete its reserves. About 40,000 to 50,000 loans a year will likely be affected by the tighter underwriting standards, or about 4% to 5% of the FHA-insured mortgages originated annually, Keith Becker, the FHA’s chief risk officer, told The Wall Street Journal. There are 60 homes listed for sale in Wallingford PA and Nether Providence Township on March 19, 2019 with an average asking price of $449,523. Home staging is key to attracting home shoppers, and maybe even more so in an era where consumers are used to watching TV home-makeover shows, according to the newly released 2019 Profile of Home Staging report from the National Association of REALTORS®. Eighty-three percent of buyers’ agents say that staging a home makes it easier for buyers to visualize a property as their future home. More than half of sellers’ agents say that staging a home decreases the amount of time it spends on the market. Staging may also offer a higher sales price too, according to the report, which is based on a survey of about 2,000 real estate pros. Forty-four percent of buyers’ agents say that staging a home increases its value. Twenty-five percent say staging can increase the home’s value by 1% to 5%, and 12% say it increases the value by 6% to 10%. Twenty-nine percent of buyers’ agent say that staging had no impact on the value of the home. Television shows about home buying may increasingly be influencing buyers’ expectations when it comes to the appearance of a home for sale. A median of twenty percent of buyers were disappointed by how homes they visit look compared with homes they see in television shows, according to the survey. Ten percent of real estate professionals surveyed said that their buyers felt homes should look the way they do on TV. There are 48 homes listed for sale in Wallingford PA and Nether Providence Township on March 12, 2019 with an average asking price of $446,761. Nationwide, the average price of a single-family home fell modestly to $249,400 in January, from $256,400 in December. The average home cost $261,600 in 2018 and $248,800 in 2017, according to new National Association of Realtors data, released Friday. The modest down tick pushes the National Association of Realtors’ Housing Affordability Index to 155.8 points, compared to 155.3 in all of 2018. The index, which has been published since in 1970, examines housing affordability based not only on median home prices, but also median family incomes and average mortgage interest rates. All three metrics improved this month – mortgage rates fell from 4.99% to 4.76% while the lowest income needed to buy an average house also fell slightly. To buy a single-family home at the national median price, a family needs an overall income of $50,016 – down from $52,800 last month. Meanwhile, the percentage of income that a family will spend on their mortgage fell to 16.1% from 17.0%. There are 48 homes listed for sale in Wallingford PA and Nether Providence Township on March 5, 2019 with an average asking price of $481,016. More Americans are becoming homeowners. The national homeownership rate increased slightly to the highest level since 2014 in the fourth quarter of 2018, reaching 64.8%, the U.S. Census Bureau reported this week. The home ownership rate has been gradually increasing since reaching an all-time low of 62.9% in the second quarter of 2016. There are 43 homes listed for sale in Wallingford PA and Nether Providence Township on February 26, 2019 with an average asking price of $454,279. Mortgage rates inched lower for the third consecutive week. Freddie Mac Chief Economist Sam Khater says the lower rates bode well for the spring home buying season, typically the busiest time of the year for home shopping. “Mortgage rates … [are] continuing the general downward trend that began late last year,” Khater says. The National Association of REALTORS® reported this week that more houses were on the market in January, rising to 1.59 million nationwide and at a 3.9-month supply at the current sales pace. 30-year fixed-rate mortgages: averaged 4.35% ,with an average 0.5 point, dropping from last week’s 4.37 percent average. Last year at this time, 30-year rates averaged 4.40%. 15-year fixed-rate mortgages: averaged 3.78%, with an average 0.4 points, falling from last week’s 3.81% average. A year ago at this time, 15-year rates averaged 3.85%. 5-year hybrid adjustable-rate mortgages: averaged 3.84%, with an average 0.3 point, falling from last week’s 3.88% average. A year ago, 5-year ARMs averaged 3.65%. There are 36 homes listed for sale in Wallingford PA and Nether Providence Township on February 19, 2019 with an average asking price of $455,116. Millennials are facing plenty of roadblocks to homeownership: high student loan debt, record high home values, stagnating incomes, and high rents. Yet, in particular areas of the country, these young adults are still increasingly finding ways to become homeowners. SmartAsset, a personal finance website, recently ranked places based on where millennials are buying the most homes. They looked at the current rate of millennial homeownership and compared it to 10 years ago. Overall, millennial homeownership is down across the 200 cities analyzed, researchers note. Only 42 cities have seen an uptick in millennial homeownership rates. Also, researchers found that home values alone were not a significant factor in where millennials are buying. 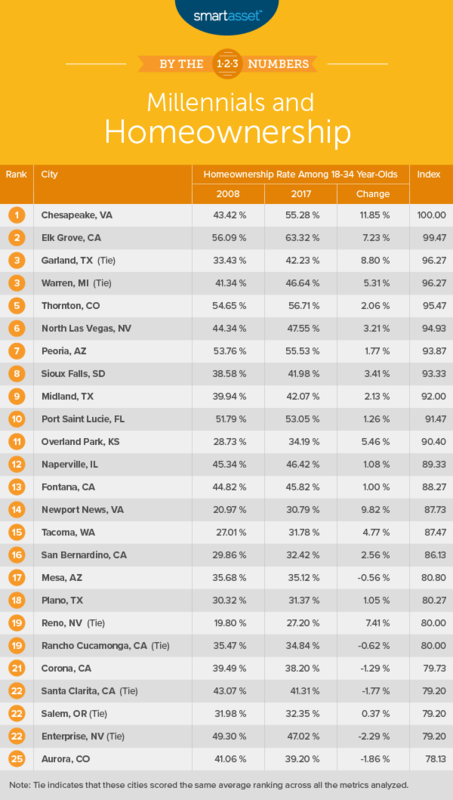 The top 25 cities were millennials are buying homes had an average median home value of $294,000 whereas the 25 cities where millennials are buying the fewest number of homes averaged near that at $284,300.